HI Im a veteran infect player and the local resident infect player at my place. Ill give you all the advice i can here. Looks like you are going for the pump style infect here ao i wont reccomend any midrangey options. AND you wanna build on a budget sov ill keep that in mind. 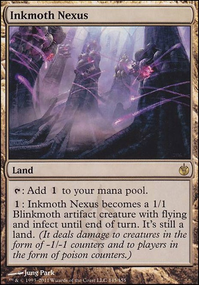 First off you might want to consider the best of the best pump spells modern has to offer. Might of Old Krosa this one leads the the most early kills, yes they see it coming but can they really dovanything about it? 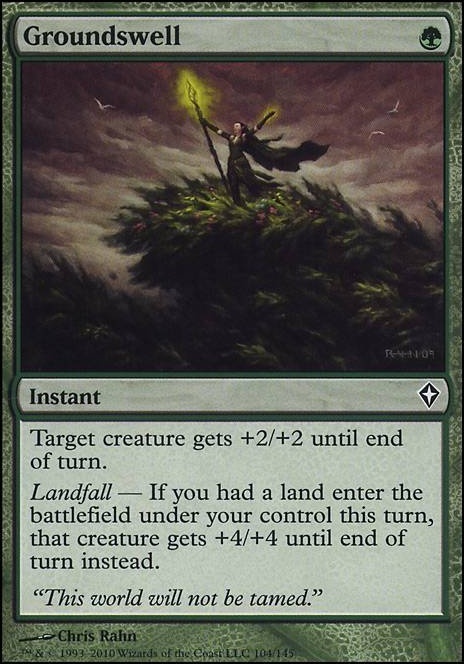 Groundswell : If yoy run these i recommend not dropping land drops mindlessly, only drop them wheny you need them (usually u just need 2-3 ) this one is great! 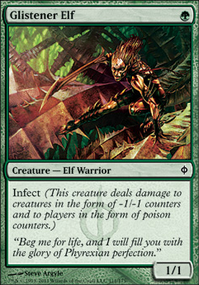 Blossoming Defense : this card obly gives +2/+2 but its what the fragile infect deck needs. Protection. Always slap this one down when saving a creature from removal. Its a good habit to not go for 10 infect if opponent has open mana, instead go for 8 and save this in response. Mutagenic Growth and Vines of Vastwood you already have and those are also amazing! 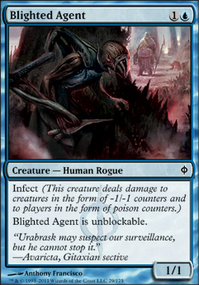 The most common splash for pump infect is usually blue as it gives 2 major players in Blighted Agent and Distortion Strike . But if you wanna keep black go ahead! I reccommend some form of removal mainboard since you aometimes just cant get through a fat Restoration Angel . Dismember is actually castable here without lifeloss sometimes! I know it isnt an infect creature but Llanowar Elves is actually great to have. Yes i know it isnt heirarch and no exalted. But its a great turn 1 play to give you t2 threat and mana left for protection. Sidwboard wise Shapers' Sanctuary has become alot more popular over Wild Defiance as its simply faster. Duress is great since you are playing black. As for lands? I know its a budget deck so Llanowar Wastes is extremely underrated. This deck is mesnt to be fast and the ping 1 doesnt add up fast enough. Oh, you already have one of those in your Maybeboard, I should have looked. What is Invigorate still doing in there? 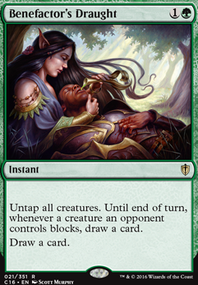 Since all of your creatures have Infect, I feel like it is strictly better for you than Giant Growth and Groundswell , since you don't care about your opponent's life total. I, too, generally prefer Scavenging Ooze over Relic for dealing with graveyard effects, but the whole point of an Infect deck is speed. I don't want to be burning a multiple green mana every turn, I just need to buy myself a round or two. For that, Relic seems much more ideally suited. The original deck features six fetch lands, so I don't usually have trouble triggering Groundswell . It's probably just local meta but I NEVER see Bogles or Affinity - but that doesn't mean that I'm not keeping Vines in the forefront of my mind when it comes to tinkering. Fact is that if I'm usually worried about using it to target my opponent's creatures, I've probably already lost the game. 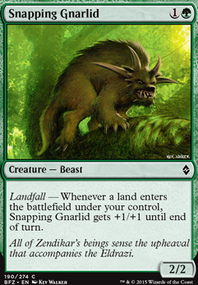 Wild Defiance is definitely on my radar as an option - Spellskite protects my creatures from a wider array of effects but gets wasted once Canopy Cover hits the table whereas Defiance gives me both an offensive AND a defensive benefit. I'm currently weighing them both to see who gets two of my sideboard slots. Oh, Canopy Cover seems sweet! I'd personally run Vines of Vastwood over Groundswell , or as a split at least. 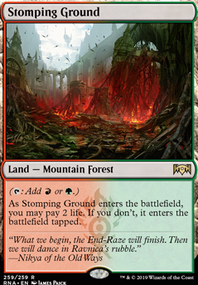 With only 19 lands and no fetches we are just not going to trigger it for 4 that often. And I LOVE Vines vs. Hardened Affinity, Bogles, and random decks with Vehicles or Equipment since we can target our opponent's creatures to fizzle Modular, Auras, Equip, and Crew. Also, with Bolt back in the meta in a big way, I like Wild Defiance in the side more and more lately. 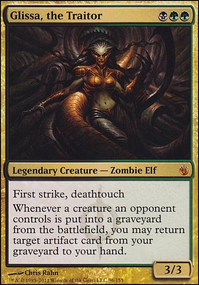 And I generally prefer Scavenging Ooze over Relic for gravehate. Use a Lotus Petal or Simian Spirit Guide (or Rite of Flame or Tinder Wall) to drop the Slaughtermaster on turn one. Use a combination of combat tricks to swing for 16 commander damage on turn two. Easy mode involves Tainted Strike or Invigorate , but it can also be done with a Groundswell or more burst-mana.